Video gaming may be the center of attention in most households for interactive entertainment, but for many people (especially those with families) there's still a place for table gaming. Whether it be the traditional board with dice and a goal to reach, the constructive that takes thirty minutes to build and fifteen minutes to play, the card decks going from one-on-one to a dozen different players, or the creative where all you need is paper and your imagination to conquer new worlds. Surprisingly, in a world dominated by the electronic, table gaming has been making a comeback in recent years, even spawning off conventions that celebrate the form and highlight new games coming out. --- SaltCON got its start last year as a replacement for another that was on the financial wain, bringing in smaller and familiar gaming companies from around the country to show off additions to current titles and highlight new games in various stages from beta-testing to pre-release. The two day event was such a success that they brought it back, kicking off today at The Fort Douglas Officer's Club this afternoon, featuring tournaments and demos for all to play and check out, plus a few unannounced surprises from those at the tables. I got a chance to chat with head organizer Dave Bailey about the event this year and what people can expect to see, along with photos from last year's convention for you to browse throughout. Gavin: Hey Dave! First thing, tell us a little bit about yourself. Dave: Hi, Gavin. 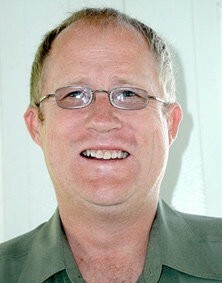 I'm a technical writer by profession and do freelance web design on the side. I have three grown children and three wonderful granddaughters. I grew up as the son of an Air Force officer and, as such, lived in many different places. In fact, I graduated from Berlin American High School in Berlin, Germany. 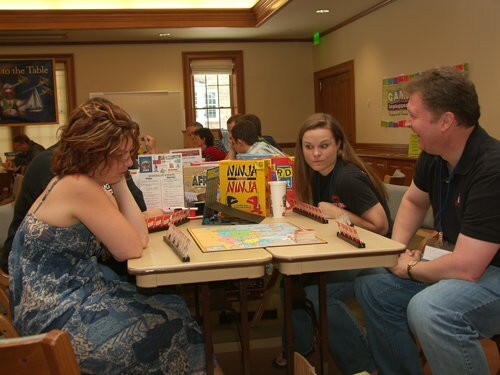 It was there, in my teenage years, that I first developed a love for playing board games. I came to Salt Lake City after high school to attend the University of Utah. I've been here since that time, except for a short foray out of state in California and Nevada. Gavin: What first got you into gaming, and what were some early influences on you? Dave: In my youth, I was very involved with Boy Scouting and, upon reaching my high school years, I helped establish a Sea Explorer Ship (Post) in Berlin when I was sixteen. The adult leader and the other guys involved in the post (there were six of us) began playing "Risk" every week after our meeting, taking turns going to each others' houses for gaming and food. It was great fun! When I graduated and went to college, I was introduced to Avalon Hill games, war games, and fantasy role playing. 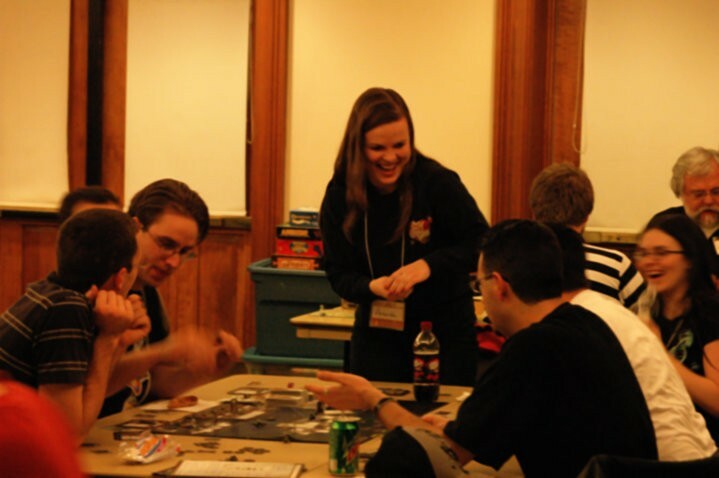 I, along with others at the University of Utah, formed a club called the Critical Mass, and we began playing games every Friday night. It was then that I started collecting games and playing many different games... eventually receiving the nickname of "Mr. Games" from my friends in the club, because I would always bring a new game to play. LOL! Gavin: For those who don't know, what is SaltCON? 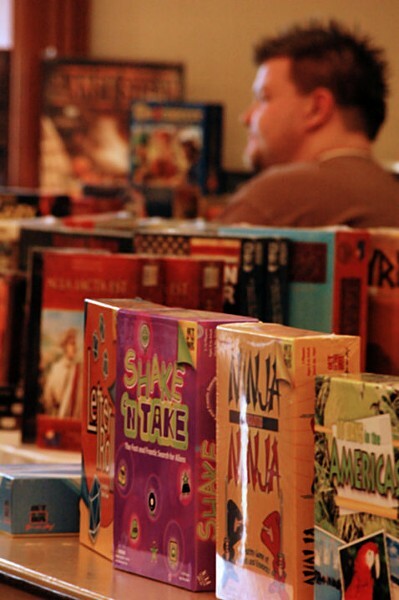 Dave: SaltCON is a convention for those interested in playing board games. We also host a yearly game competition called the "Ion Award" for unpublished and newly-published game designers. 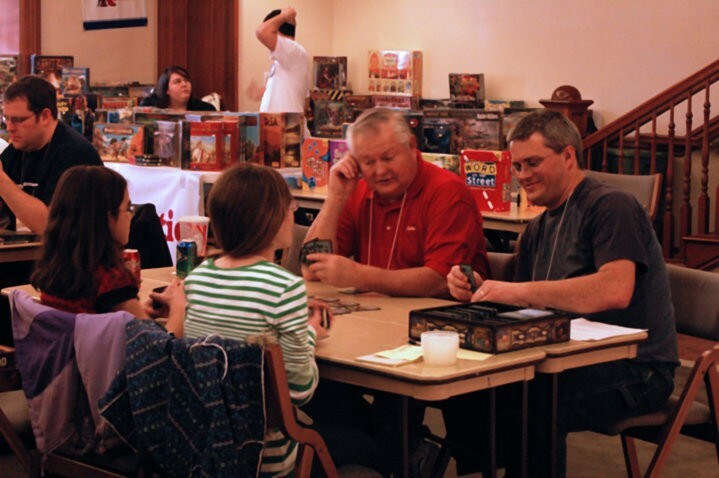 Those who attend have the opportunity to find like-minded individuals and families who enjoy learning games and sharing their passion for games together. Many different game publishers attend, too, and those who come to SaltCON have the opportunity to purchase (or win through one of our many free drawings) the newest and most popular games. Also, we often have designers of newly-published games in attendance who can demonstrate their new games to interested people. SaltCON is, most importantly, two days of FUN! Gavin: When did the idea for SaltCON come about, and who did you initially bring on to make it happen? Dave: Another group of local gamers hosted a convention called "A Gathering Of Strangers" a few years ago. It was a fun time for all who attended, including myself and my other SaltCON partners. Two years ago, the person behind "A Gathering of Strangers" was unable to host the convention and allowed my partners and I to do so in his stead, rather than have no convention that year. Steve Poelzing, Phil Kilcrease, Dale Gifford, and I had our first experience with hosting a convention then. We enjoyed ourselves so much that we wanted to do it again! Thus was born SaltCON. We set up a company to do so and held our first convention under the SaltCON name last year. We tried some different things from what we did the first year and the convention was a great success! This year, so far, has been even better! After last year's convention, we invited Sean MacDonald to join us as a fifth partner and he has been a great addition to our group. Gavin: How did you go about getting different companies on board to display their games for play? Dave: Our first main attraction was the "Ion Award" game design competition. We invited publishers to come to SaltCON as judges for our game competition and were pleasantly surprised at the support we received. Publishers such as Fred Distribution, Out of the Box Games, and Mayday Games are among a few of the many who agreed and sent judges to the competition. We also had support from national publishers, such as Rio Grande Games. 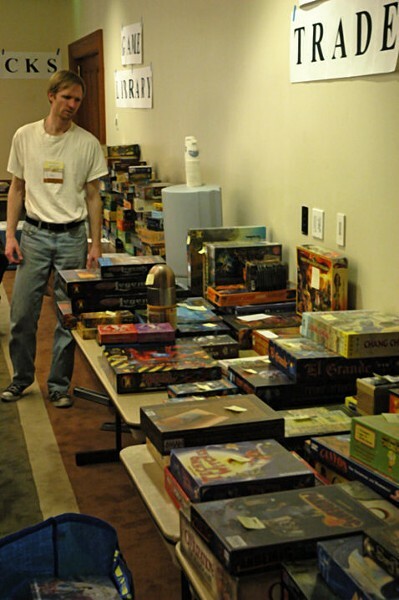 Many other publishers chose to attend and sell their games at the convention. We've also had wonderful support from many local game stores, most significantly "Game Night Games" for the past two years, "Boardgame Revolution" last year, and "Hastur Games and Hobbies" this year. Word of our success last year and the excellent job done by Dale Gifford, our partner in charge of sponsorships, has caused our sponsorship numbers to rise this year. We are very grateful to ALL of our sponsors and I apologize for not having mentioned them all here. But know that we appreciate them so, so much and encourage everyone reading your blog to visit them by clicking on their logos as found on every page of our website. Gavin: Last year was the first year for the convention, what was that event like for everyone? Dave: It was great! The Fort Douglas Officer's Club was a fantastic venue for us and everyone who attended had a fun time. We provided a questionnaire to attendees about their experience at SaltCON and were very pleased that they found it to be such a great success. As for us, the organizers, we learned a lot of lessons and found ways to make the convention better. We have done some of those things this year and are very confident that it will be an even better experience for those attending. 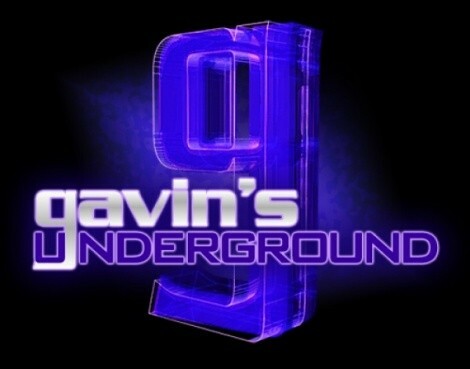 Gavin: Did you have an idea that you'd be back this year or was it still in question? Dave: No, it was never in question. We have great hopes of making SaltCON a destination convention, meaning a convention that people will travel to even from out of state. This will take a few years to accomplish so we knew that we'd be back this year. We are hoping to grow each year until we truly live up to our moniker of "the Sundance of gaming." Gavin: Venue-wise, what made you choose the Fort Douglas Officer's Club at the U? Dave: "A Gathering of Strangers" had been held in the Union Building at the University of Utah in its years before the year we hosted it. In fact, it was due to the renovations taking place at the Union Building that made the location unavailable the year we hosted and led to the opportunity for us to do so. When we went out searching for a replacement location, we found that the local hotels were a bit out of our price range and the number of attendees expected from them were beyond what "A Gathering of Strangers" had done in previous years. So we were pleased to find that the Officer's Club was just the right size for us, as well as priced right, too. It has been a great venue for us. Gavin: This year, who will you have on board for game demos, and are there any particular games you're looking forward to seeing? Dave: This year, we have Sean MacDonald presenting his game "Pastiche" (published by FRED Distribution) and Alf Seegert sharing his game "Trollhalla" (published by Z-Man Games) with us. In fact, the president of FRED Distribution is personally attending the convention so as to be present for the world-wide release of "Pastiche" at SaltCON! 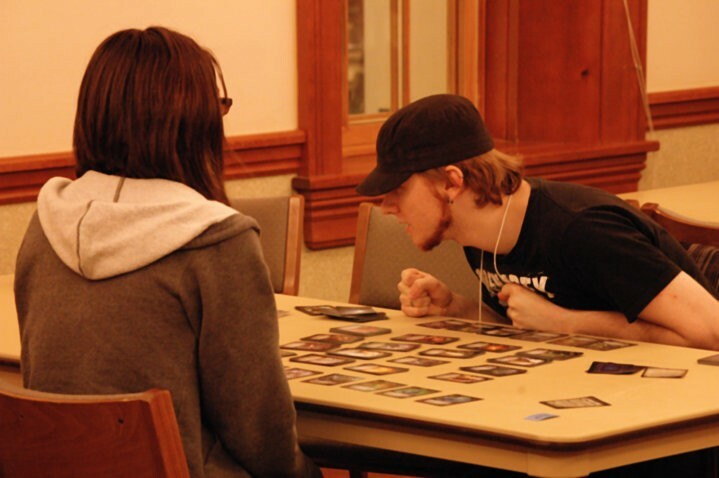 Other games being demonstrated include, "Bellicose Fantasy Battles" (Sanity Studios), "Crokinole" (Mayday Games), "Feast & Famine" (Good Knight Games), and "Magic: The Gathering" (Hastur Games & Hobbies). Gavin: Tell us a bit about the events you have planned and what people can expect to see at the event? 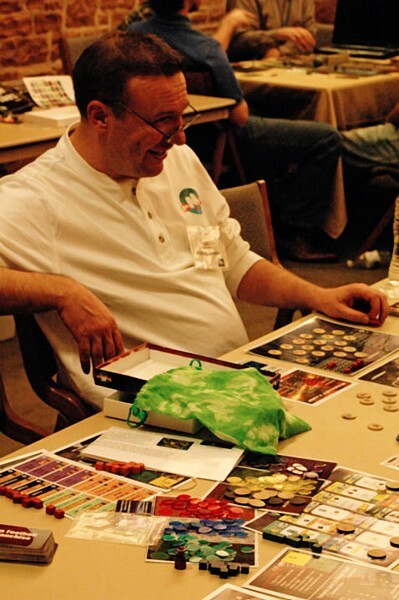 Dave: We have a full range of events scheduled for SaltCON, including 28 hours of open gaming, seven different game tournaments ("Conquest of the Empire", "Small World", "Dominion", 1-on-1 "Crokinole", "Pastiche", "Word on the Street", and "Magic: The Gathering"), game demos, game concierges available to teach games, hourly giveaways of popular games donated by sponsors, trade tables ("Math Trade" and "Garage Sale"), and a game library of hundreds of titles available for attendees to play! Most importantly, people coming to SaltCON can expect to have FUN! Gavin: What's the Ion Award and how people are able to compete for that? Dave: The "Ion Award" is a game design competition for any game designer with an unpublished and completed prototype. The designer first submits a picture of his/her prototype with a game abstract to SaltCON, which is then reviewed by judges according to preset judging areas. 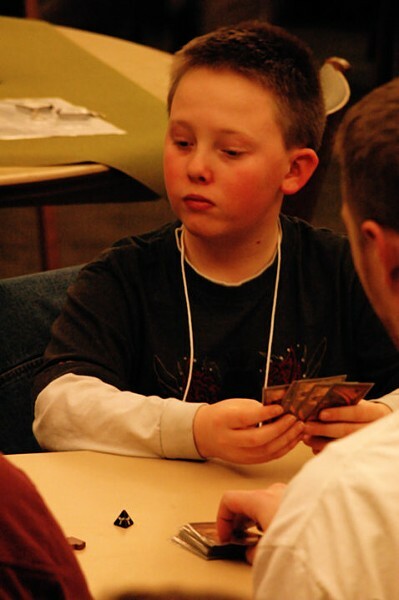 The designers of those games with the highest cumulative rankings are then invited to attend SaltCON to present their designs to the judges personally. Winners are then chosen in the strategy game category and the family/party game category. However, publishers have the option of indicating those games they wish to see personally even if the game does not qualify for the finals of the competition. It is our hope that the competition process results in providing new game designers the possibility and means to have their games published. Gavin: Are you still looking for volunteers to help? And how can someone volunteer? Dave: We are so fortunate that we have all of our volunteer slots filled for this year's convention. However, if we continue to grow as we fully expect, next year we will need even more volunteers. It's a great opportunity for people to be a part of a great convention and also get a reduced rate on attending for their volunteer service. Simply e-mail us at volunteer@saltcon.com and we'll be happy to provide more information. Gavin: Going into the industry for a bit, what's your take on board and strategy games these days, and how they're holding up in a tech savvy world? Dave: I believe they're holding up very well. The shared experience of playing a board game with other people sitting with you is still something people very much enjoy. The number of games being published in local game stores and over the internet is a booming business. And even in the tech-savvy world, people are playing board games with each other online. Some of the most popular titles are available for online play at any time. Some of the biggest game conventions in the world, such as Essen, GenCon, and BGG Con, regularly attract thousands of attendees each year. I don't see there ever being a time when board games will not be popular! Gavin: Do you feel gaming of this formation will continue growing with new fans and creators, or is it slowly becoming a dying art? Dave: I believe it will continue to grow and prosper. 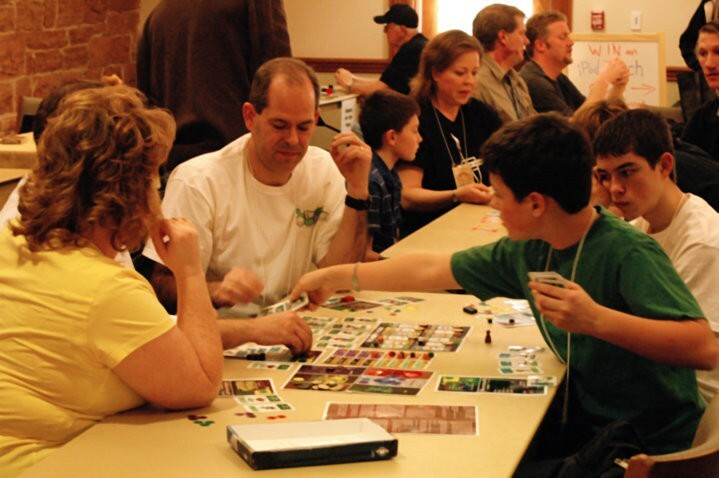 A very good local example of this is the Board Game Designers Guild of Utah. This year alone, six designers from that local club will have their game designs published. Similar to the game design competition we hold at SaltCON, other conventions are doing the same thing--on a national level, publisher Rio Grande Games is backing an annual competition at another convention to encourage new game designs. In Germany, the game design competition Hippodice is going strong. There is no lack of new designers and designs out there. Rather than decreasing, it is doing just the opposite--increasing in numbers and interest. Gavin: Are there any games out there right now that you believe people should be checking out? Dave: First and foremost, I'd like to encourage your readers to come try out "Pastiche" and "Trollhalla" at SaltCON. 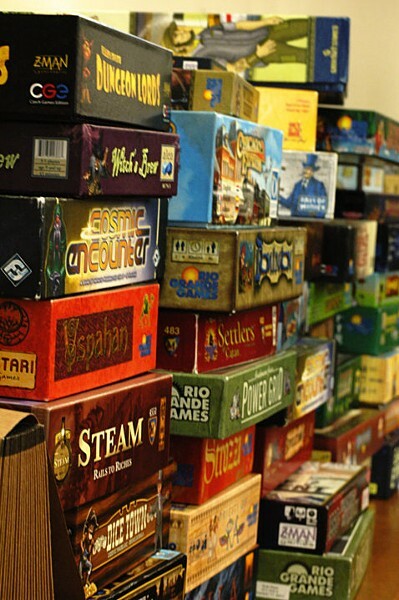 Some of the most popular games continue to be "Ticket to Ride," "Settlers of Catan," "Carcassone," and "Dominion." Other newer titles that I personally enjoy are "Small World," "Founding Fathers," "Cosmic Encounter," and "Thunderstone." There are so many games to try that it's impossible to list them all here. Come to SaltCON and you'll find these games and many more that you'll have fun playing! Dave: Just that we are so pleased to be able to present SaltCON to the Salt Lake City community. 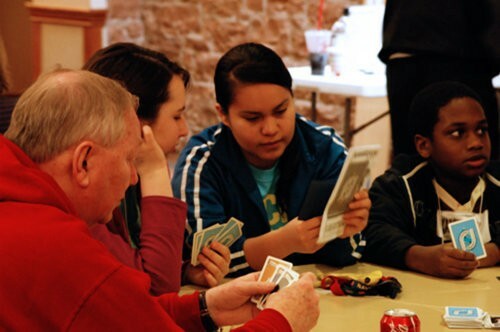 Board gaming is a great match to our local community and its emphasis on families. Playing board games together is a great way to spend family time and to learn and bond with each other. We're so glad that we can be a part of encouraging such a positive and rewarding activity in today's complicated world!